Hey. Got tics? You’re not alone. Up to one in five kids will have at least one tic at some point. Including the guy who wrote this book! Dr. B. Duncan McKinlay, Psychologist (‘Dr. Dunc’) has Tourette Syndrome. That means he’s been living with both motor tics (movements he has a hard time stopping) and phonic tics (noises he has a hard time stopping) for most of his life. He knows firsthand how annoying, embarrassing, misunderstood, painful, and disruptive tics can be. For years, he’s been educating people all around the world by means of his presentations and website, and through appearances on television, in magazines, and on film. 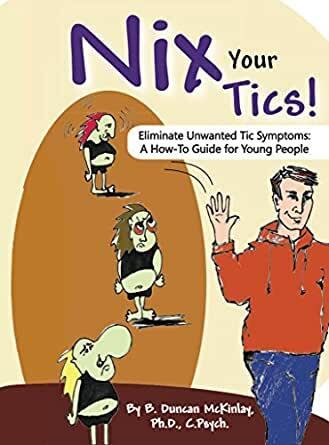 Now, in Nix Your Tics!, he wants to share with you a well-established, evidence-based practice* he uses to manage tic symptoms in both himself and in his patients. The Second (E-)dition: Re-edited & revised with all-new content! * New section: Starve that Tic! * Interactive widgets downloadable from a Kindle 'K'ompanion webpage permit completion of steps & tracking of progress! * New integration with web-based content, including support groups and the online, Nix Your Tics! Facebook community! * All-new multimedia elements (i.e. pop-up text) and summaries to enhance engagement & accessibility! * Access to a 2012 audio interview with Dr. Dunc comes with the book, accompanied by a slideshow of pictures taken from the Life's A Twitch! website! * Ages 10 & up. Tourette's Syndrome "Master Secrets to Stopping Your Child's Vicious Cycle of Facial, Body & Vocal Tics, Naturally Without Any Side Effects!" 5.0 out of 5 starsGreat for young people - lots of good info! I bought this ebook on the recommendation of a therapist for my daughter who suddenly, inexplicably developed a motor/vocal tic. The book is written for young people (pre-teens on up) and is in a readable, humorous style that will appeal while giving out some really good information. The fact that it's written by a man with Tourette's only ups its credibility. It is a quick read, and a great reference to look at as you or someone you know is working to live with a tic. Highly recommend. My 10 year old has a few mild tics that under certain situations become quite pronounced. This book has been helpful for me in changing my response to them. I have talked to my son about the main ideas in this book and told him that when he is ready he can work on eliminating them. Now, as we both do our best to ignore his tics and he knows he can fight them when and if he needs to, I find that they are becoming less of a problem.